The Start to All Petrol Engines. The term spark ignition is used to describe the system with which the air-fuel mixture inside the combustion chamber of an internal combustion engine is ignited by a spark. The process uses an electrical field induced in a magnet or coil to build many thousands of volts that are collapsed via a timed circuit. The resulting surge of current travels along a wire and terminates at the spark plug inside the combustion chamber. 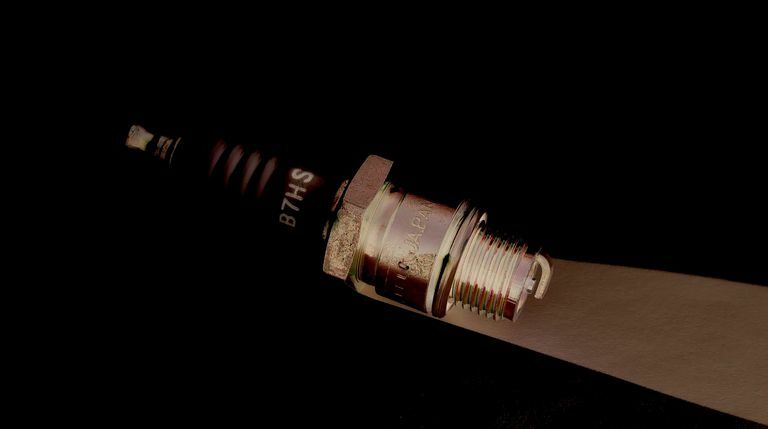 An electrical spark occurs as the charge tries to jump the precision gap at the tip of the spark plug at exactly the moment a precisely metered mixture of fuel and air — developed through atomization — has been thoroughly compressed in the combustion chamber. The resulting controlled explosion delivers the power to turn the reciprocating mass inside the engine. Due to the nature of petrol as a fuel, all petrol engines use spark ignition. Spark ignitions are colloquially known as petrol engines in the United Kingdom and South Africa while called gasoline engines in the States. Diesel engines, on the other hand, use only compression ignition to begin their power process. Spark ignition typically utilizes two- or four-stroke methods for converting petrol to power. The first stroke, the intake, pushes the piston down, pressurizing the fuel-air mixture in the combustion chamber. This is immediately followed by the compression stroke where the piston compresses this mixture at the top of the cylinder where it is ignited by the spark ignition. Then, the power stroke moves the engine —typically two rotations on the power belt. Finally, the exhaust stroke releases the leftover gasses remaining in the chamber, typically exiting through the tailpipe. Petrol engines — which use spark ignition — are typically considered to give off lower emissions and provide higher efficiency and performance capacities than diesel engines. Typically more lightweight, quieter and cheaper as well, these are the most common type of engine on the market. Along with the added benefit of recent consumer Petrol prices becoming far less expensive than that of diesel, it’s much easier to find petrol. Petrol engines are also far less likely to break down in the cold because they do not require a pressurization or heating of the air-fuel mixture to ignite the spark and in turn the engine. However, these engines also come with their fair share of disadvantages. Typically spark ignition vehicles require more regular maintenance than diesel engines. Petrol vehicles have significantly shorter lifespans than compression ignition autos. Furthermore, an incorrect mixture of fuels — such as the wrong caliber biofuel — may result in irreparable damage to the engine. Recently, with the advent of zero and partial zero emissions vehicles, petrol engines can yield entirely no harmful emissions and maintain even better gas mileage than their diesel counterparts. Still, it’s the electric automobile that’s truly the wave of the eco-conscious auto industry. In coming years, rising availability and lower prices may drive even the most eco-friendly petrol engines off the road! Previous articleWhat is a Motorcycle Stator?